Although many of us have mixed feelings about winter, it’s really one of the most beautiful times to explore Winnipeg. If you’re stuck in the city this winter, have no fear – there’s a ton to do in Winnipeg’s West End to embrace the frosty weather. Over the next several weeks we will be posting ideas for spending a day in our neighbourhood. The West End has some of the coolest (read warmest) little shops, venues and restaurants that you may have never heard of. We can hardly wait to share the neat stuff going on in the neighbourhood, so stay tuned! Since the West End is pretty convenient for all modes of transportation, all our recommendations are within a convenient distance whether you’re on foot, busing, biking or driving. So throw on a pair of long-johns and dust off your winter boots and explore some of the delightful little places in our city! Begin your day at this little café that’s been around for decades, but, in the last several years, has begun serving Ethiopian cuisine. Although the wait for food is short, the interior décor and relaxed atmosphere make this restaurant a joy to spend as much time as possible in. If you’re unfamiliar with Ethiopian cuisine and want to try it out, go with a combo platter. If you’re in the mood for standard diner fare, the back of the menu has the burgers and fries. You will find the combo platters on page three of the menu. Remember books? Those rectangular stacks of paper, bound on one side, never needed to be recharged? Well there’s a room full of them perched on the top floor at the University of Winnipeg Centennial Hall. Not only are there some pretty comfy seats, this fifth floor library affords some of the most scenic views of the West End neighbourhood. Grab a book at the library or bring your own and spend a couple hours enjoying the relaxed atmosphere that only a University on a Saturday can deliver. 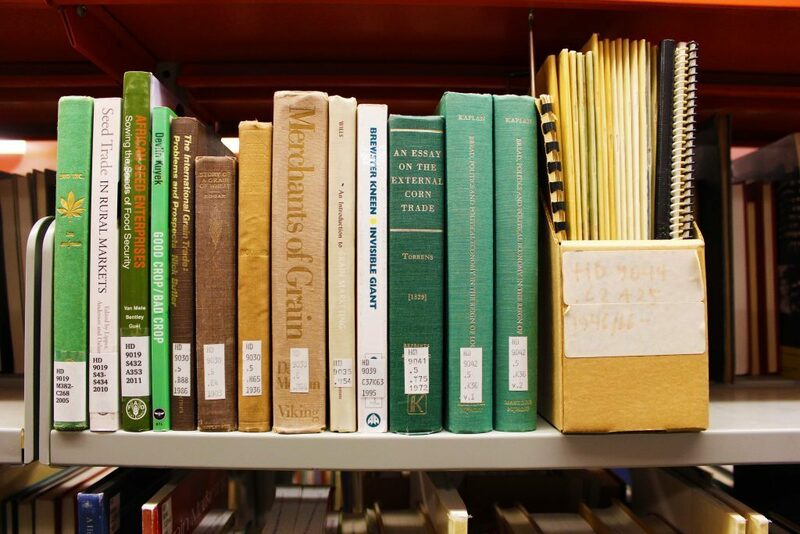 Haven’t you always wanted to read An Essay on the External Corn Trade?? If not, have no fear, there are other options! The Good Will is the perfect place to wrap up your day of exploring the West End. Grab a drink or a bite at Have A Nice Day, the restaurant conveniently attached to the pub, and while away the remaining hours of your day in the West End. The Good Will is a bustling place almost every day of the week. Whether it’s crokinole on Sunday, karaoke on Wednesday or a show on Friday, the Good Will’s got something fun going on. If you’re into beer, try the Good Will’s house beer, the Furby Street Lager. It’s named after a nearby West End street.